In recognition of the heroic efforts on the part of our firefighters, RCMP, Emergency Services all other volunteers and organizations involved in the Okanagan Mountain Park Fire, Bylands would like to announce the early offering of a rose variety that is scheduled for release in 2004. The name of the variety is My Hero. Bylands will donate a rose to each family that has lost their home. For every My Hero rose sold, $6.00 will be donated to the Red Cross Fire Relief Fund. 1. You can buy a My Hero Rose coupon and donate it to the Re-Beautification of Kelowna, which the City of Kelowna Parks Division will plant at selected sites throughout the community. 2. You can buy a My Hero Rose Coupon and donate it to the Re-Beautification of various other communities that have been severely affected by fires throughout BC this year. We will be setting up the distribution through various participating retailers for the 2004 season. 3. You can buy a My Hero Rose Coupon to give as a gift or have for yourself. We will be setting up the distribution through various participating retailers throughout Canada for the 2004 season. Bylands currently supplies over 750 retailers across Canada and is setting up programs to sell these coupons through many of these retailers. The goal is to sell up to 50,000 roses. 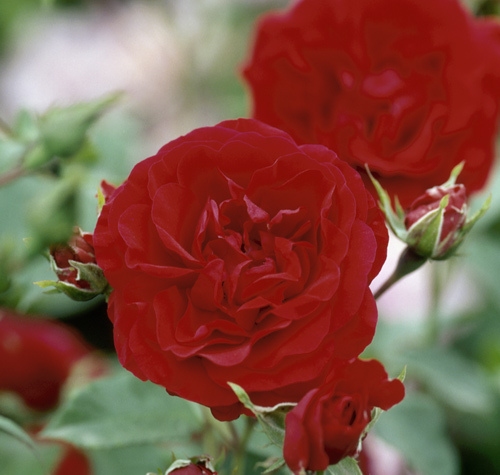 The My Hero Rose is part of a new collection of roses named Easy Elegance from the Bailey rose breeding program. These own root roses are bred naturally, without spraying, to ensure that only the strongest selections will survive with superior hardiness and disease resistance. That means repeat blooming beauty and unparalleled ease of care. The My Hero Rose is a double red that fades to a deep pink as it matures. Massive displays of 3.5-inch blooms are self cleaning (old blossoms fall off) and continue to bloom all season. The foliage is a satiny light green and shows well on this shrub that grows to about 1m (3 ft). Phone 1-877-7MyHero (1-877-769-4376) during business hours, email to [email protected] or fax 1-250-769-5566 to place orders and for more details.